L 16-20″(41-51 cm) W 36-44″(91-112 cm). Generally quiet, shrill “kek-kek-kek” given around nest. Description: Slate gray above, black crown and nape. Heavy dark mustache gives helmet like appearance. Pale below with unstreaked throat and barring on breast. Female is browner. Juveniles buffer underneath with heavier streaking. Habitat: Most likely to be found in open grassland habitats with nearby cliffs, but will inhabit cities with tall buildings. 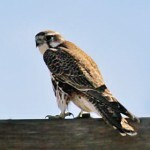 Where in Nebraska: Rare to occasional migrant and winter visitor across the state. 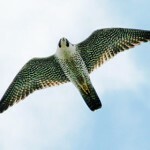 Recent releases in Omaha and Lincoln, Nebraska have led to several successful nestings. 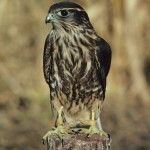 Status: After population declines due to pesticide (DDT) accumulation, the falcon has recently been delisted from endangered to threatened by the US Fish and Wildlife Service. 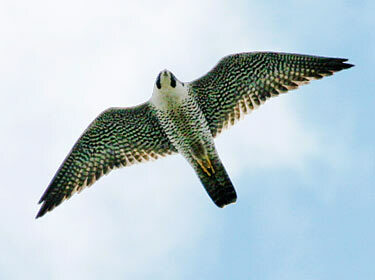 Fun Facts: The Peregrine Falcon is a very fast flier, averaging 25-35 mph in traveling flight and reaches speeds up to 70 mph!